Lauren's Luxe Senior Session was amazing to say the least. After hair and makeup at Zen Salon and Spa we headed out into the downtown Iowa City district for her first and most formal outfit. Her classic black and white striped romper goes perfectly with the clean and modern design of the U of I Voxman Music Building. A few of her friends even jumped in for shot! Her next outfit lent itself well for bricks and ivy. I love how her jacket pops against the greenery! We even got a few shots of Lauren with her family in this outfit! Next it's time for something a bit more casual. Lauren wanted to showcase her love for Iowa with a fun tee and we picked a funky mural to set it off. On our way to change we can across some steps with the perfect yellow stripes and just had to stop and use them! After having some fun in the Iowa tee we ventured over to the Northside of downtown Iowa City where we found a backdrop to compliment Lauren and her sisters maroon outfits. Aren't they the cutest sisters ever? 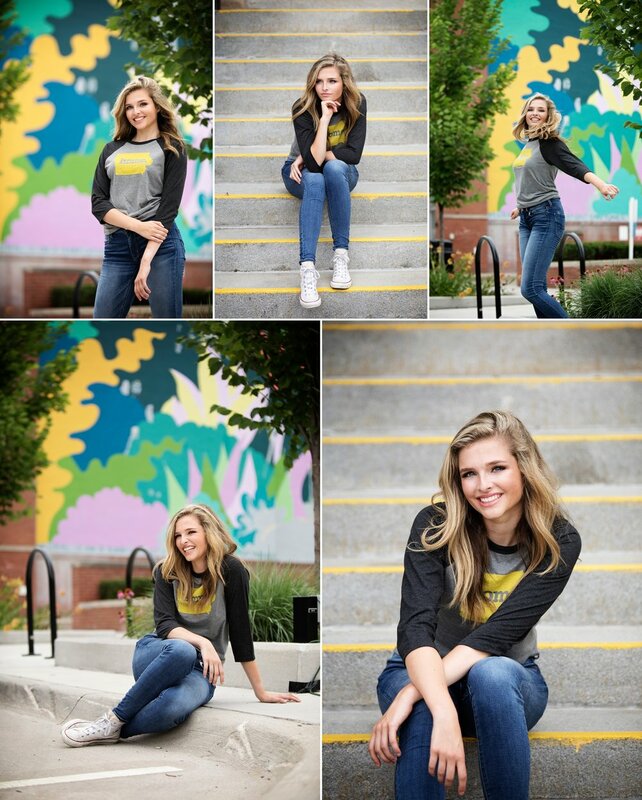 I couldn't resist getting a couple images of Lauren's sister Anna by herself as well. If you've been following me on social media you know that I like urban settings for seniors, however this more natural location might be my favorite of Lauren's session. The light was AMAZING at the Fossil Gorge and we found a field of clover as well as those striking birch trees. As if this session wasn't epic enough we ended up at the Coralville Lake Beach for a grand finale. The sun was starting to set giving us the sweetest light yet. Lauren was even up for getting in the water! Her bestie was right there with a towel as soon as we were done. We even managed to escape stepping in goose poo!